Bohemian Switzerland National Park (České Švýcarsko) is located in the north-western Czech Republic. The Elbe River separates it from Germany and the Saxon Switzerland National Park. 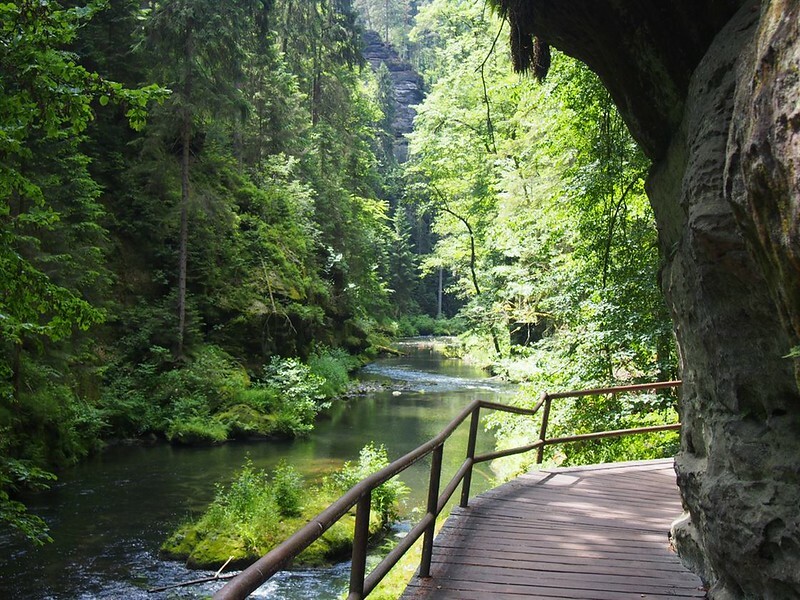 Bohemian Switzerland, sometimes called Czech Switzerland, can be a fun and inexpensive destination with hiking trails suitable for all ages. If you are coming from Děčín, you will arrive in the village of Hřensko first. You might not find any parking spaces here unless you have arrived very early in the morning. Keep driving to Mezní Louka where you will find a large paid parking lot behind Hotel Mezní Louka. I suggest that you start your hike to Pravčická Gate from Mezní Louka. If you parked in Hřensko, I still suggest that you take bus number 434 up to Mezní Louka and start your hike there. The start of the trail is behind the information centre, across the street from Hotel Mezní Louka. The path is well marked and you do not really need a map for this hike as long as you follow the red trail marks. Approaching from this end, there are very few steep inclines and most of the beautiful scenery is on this side of Pravčická Gate. This part of the trail is 6.5 km to the gate. Little Nomad (age 4) had no trouble with this trail. Most of the trail is wide and easy. 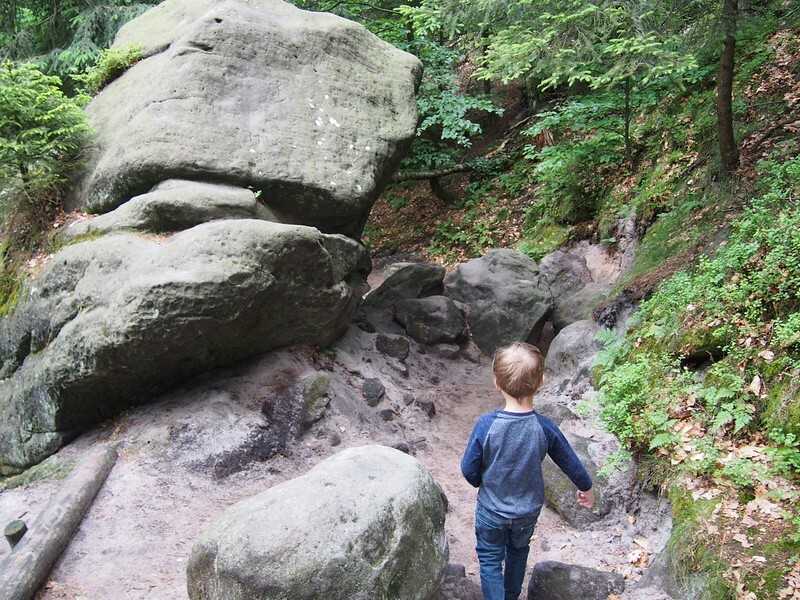 However, there are a couple of spots that require climbing down over some rocks (pictured above) or stone stairs, making the trail impossible for wheelchairs or strollers/pushchairs. Next to the stone arch is a former holiday chateau called Falcon’s Nest (Sokolí hnizdo). Built in 1818 by Prince Edmund Clary-Aldringen, the building is now a restaurant. To get into Falcon’s Nest or any closer to the arch, you will need to pay an admission fee: 75 CZK for adults and 25 CZK for children over 6 years. The restaurant has a limited menu of goulash, fried cheese, schnitzel, french fries and other small snacks. Beer (Budvar), wine, soda, coffee, and lemonade are available. There is also a small kiosk next to the restaurant that sells párek (a type of sausage), drinks, and ice cream. After your rest, follow the trail to Hřensko. The trail is straight and mostly downhill. My map says that it is 5 km from here to Hřensko but you will reach the bus stop first and this part of the trail felt easy and quick. Take the bus to wherever you parked. Since we were hiking with our 4-year-old, we were done hiking for the day. If you started very early in the day and feel like going farther you could possibly combine the Edmund’s Gorge trail in the same day. It depends on your speed and endurance. I recommend that you start this hike in Mezní louka due to the availability of parking and so that you start with an easy downhill walk into the gorge instead of an uphill walk at the finish. The path here is wide and we passed more than one family with a baby in a pram. Two sections of this trail are passable only by boat. Cute cabins for rent at Autokempink Česká brána. 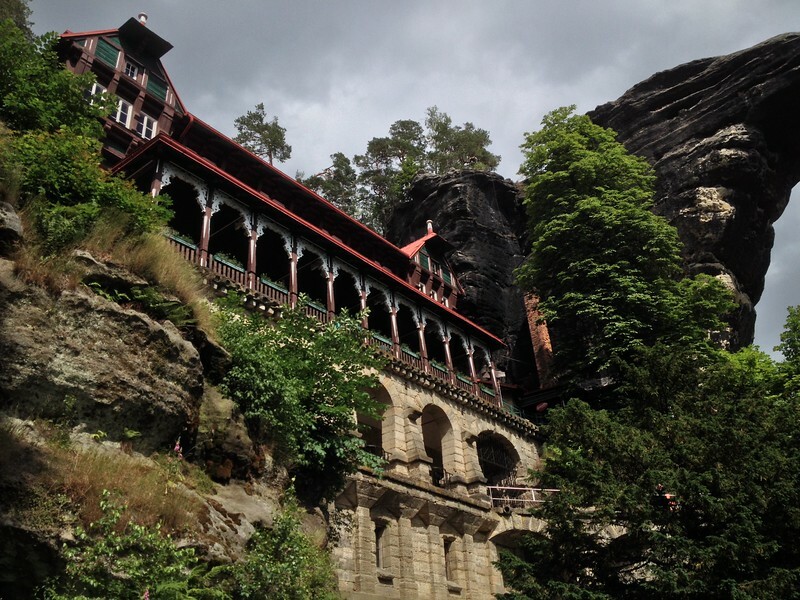 Kemp Mezní Louka – is located a short walk from the start of the trail to Pravčická Gate or the trail to Edmund Gorge along the Kamenice river. You can take a bus number 434 from Mezní Louka to nearby Hřensko or to Děčín. *Recommended* Autokempink Česká brána We stayed here and I highly recommend it. The woman at reception was very friendly and spoke excellent German and English. The space for tent pitches is level and grassy. 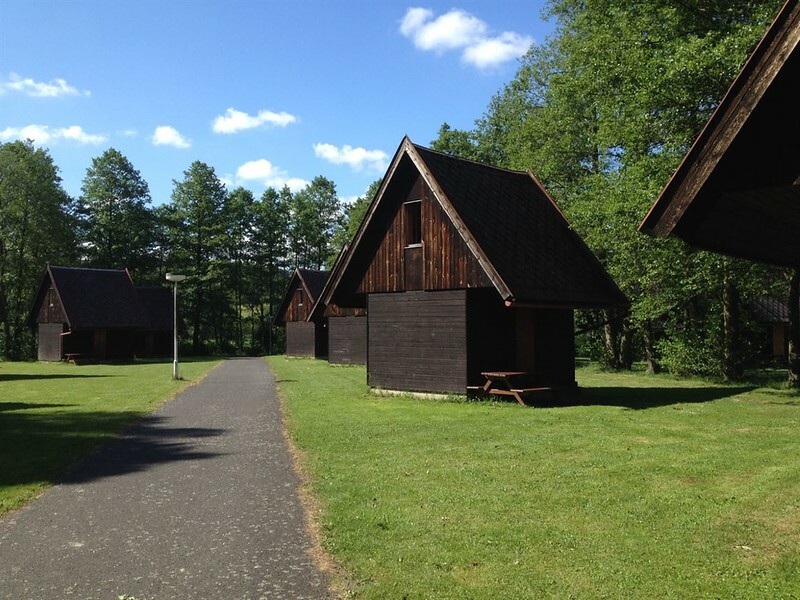 There are two types of cabins for rent. The 2 person cabin is very small, with just enough room for twin beds. It would be appropriate for cyclists not carrying their own tent. It costs only 320 CZK per night. The larger cabin can sleep 4-5 people and has a kitchen with a refrigerator. Prices start at 600 CZK per night. Pitches with electricity are available for caravans and campervans. The toilet facilities are shared for the entire campground and were clean. There is a pub on site with a small playground and a pet bunny. If Autokempink Česká brána is full, there are two other campgrounds on the same street. Autokemp Aljaška Their webpage says that they have space for tents and caravans but I did not see them when we drove in. They also have cabins for 2-4 people. Camp Pod Lesem This is a very small campsite with tent pitches and cabins for rent. They do not speak English but probably speak some German. There are no cooking facilities here but there is a restaurant on site. Kemp Decín – This campsite is located under a highway bridge and gets complaints about traffic noise. In the ACSI guidebook, this campground claims some amenities like a swimming pool that don’t actually exist on site. The swimming pool that they are referring to is at the aquapark in the town of Děčín and costs extra.